This article explains why the trails being left in the sky by large aircraft cannot possibly be condensation trails ("contrails"). Once this is understood, then we are left with the ominous question: "What do these trails consist of?" You can see the video version of this article here. NOTE: This article has been opposed on the internet by government-paid disinformation employees. These intentionally-deceptive disinformation programs are using fabricated science to claim that high-bypass turbofans create trails. In one example, a false study is being used to convince the public that high-bypass turbofans create trails. This study is not only based on false science and fabricated numbers, it was published after widespread spraying began and is an obvious attempt to fool the public into accepting geoengineering: The largest crime against humanity in human history by convincing the public that jet trails are a "normal result of fuel combustion", which is simply not true as will be demonstrated below. Those in the very highest positions who are responsible for this spraying campaign will do anything to conceal it, even going as far as rewriting jet engine training manuals and courses to teach new mechanics that these engines produce trails. There is no better way to convince the public than to have "expert mechanics" believing trails are normal and relaying this disinformation directly to the public. We see examples of this type of disinformation in the education system right now with the rewriting of the second amendment in school textbooks. We have also received first-hand accounts of military tankers and drones painted to look like passenger jets on several occasions. This causes the public to believe that normal passenger jets are producing trails further enhancing the lie that trails are normal. Remember, a crime this enormous will be concealed by lies and coverups just as enormous. The fact that high-bypass turbofan engines cannot produce trails is the reason life-long skywatchers and pilots have never seen trails come from these engines until widespread geoengineering began (with very few special exceptions including rare water injection engines which are outlined in the article below). This is the reason professional and recreational pilots alike have contacted me expressing their disgust at the lies being thrust on the public by our governments and educations systems. The newest tactic to conceal spraying programs from the public is to use shorter trails and to fly at higher altitudes to make these trails harder to see. Furthermore, school textbooks and jet mechanic training manuals have now been rewritten to include the claim that contrails are common and normal. The disinformation campaign is very thorough. The Global Depopulation Agenda Excellent lecture showing the use of false science to promote a specific agenda. Despite media failure to disclose, and “government” disinformation to the contrary, there is and has been a weather modification program in full operation for many years. The high –thin cirrus that jets have been spreading across the sky that the public has clearly seen as long trails of jet exhaust and spray turning into clouds and haze can and is changing the weather. There are clouds now that have never existed before. The cloud nuclei being used are composed of metallic salts in nano form, all potentially toxic to life as we know it. We have documented accumulations of aluminum, strontium, barium and many others in the soil, the rainwater, snow, and plants at levels thousands of times higher than any normal condition, and many should not be present at all. I started seeing barium, aluminum oxide, and strontium come on the (Air Force) base. In my background as an Industrial Hygienist and an Environmental Specialist, I conducted…sampling…and saw (contamination) limits in my community that would make your head spin. And I started to realize that those peers within my professional community that were trying to wake those of us in the military up, were right! High-bypass turbofan engines do not create condensation trails. The ratio of air-to-exhaust is much too high to facilitate the formation of condensation because the majority of air expelled from the back of the engine is not combusted. It is passed through the "fan" and simply blown out the back without mixing with any fuel at all. Turbine engines are the power plant for high-bypass turbofans. Turbine engines are used in other applications besides powering jets. They are also used to power helicopters and many prop driven planes, yet we never see trails coming from these types of vehicles, and the reason is simple. Turbine engines virtually never produce condensation trails. In the video above, notice the large ratio between the bypass fan and the "core" part of the engine. The formation of condensation trails requires vacuum (reduction in air pressure), cold temperatures, and high humidity, however, the output side of a jet engine contains mostly outside air that has been pushed through the engine by the large ducted fan (The ducted fan is the set of spinning blades that you see when you look at the front of the engine). This high-pressure at the output of the engine is contrary for the formation of condensation trails because pressurized air has the ability to hold much more water in suspension, without producing condensation. NOTE: On very moist days, you may, on rare occasions, see a condensation "tornado" spiraling into the intake side of a high-bypass turbofan engine during high-thrust conditions. This is formed by the extreme, rapid vacuum formed on the intake of the engine. This vacuum induces condensation because air at reduced pressure cannot hold as much water. On the contrary, air on the high-pressure side of these engines cannot condense because it is not under vacuum. High school science experiments demonstrate this with a vacuum jar. As the air is expelled, a gentle mist will form. When the valve is opened repressurizing the jar, the mist immediately disappears. Even in this image, the ratio of air flowing through the fan vs. air flowing through the turbine is out of proportion. In reality, much more air flows through the fan than depicted here. Only a fraction of the air that enters the engine is taken in by the turbine engine. This air is mixed with jet fuel (essentially kerosene), combusted, and then exits the engine under very high pressure and high temperature. Condensation formation requires a decrease in ambient air pressure to form, but the output of the turbine is under very high pressure which prohibits the formation of condensation trails. Physics also tells us that, under the right conditions, condensation can form when air is cooled. Since the exhaust of the turbine engine driving the high-bypass turbofan is very hot – and remains hot for a long distance behind a jet, condensation formation is – once again – prohibited. (Hot air holds much more water without producing condensation.) Furthermore, the burning of fossil fuels produces black carbon soot, not water as claimed by some websites. You can see this black soot being expelled from the engines as you watch jets take off from an airport. Furthermore, the ratio of air-to-fuel used in high-bypass turbofan engines is as high as possible (lots of air but relatively little fuel) so as to keep engines efficient and cost-effective, so the reduced amount of fuel in this ratio results in a lack of water in the exhaust, and this is yet another reason high-bypass jet turbofans cannot produce condensation trails. In short, the more efficient the engine, the less fuel it uses per unit of air moved, and this renders high-bypass turbofans virtually incapable of producing condensation trails, unless they use water injection, which is extremely rare today (see section below). Simply said, every condition necessary for contrail formation is absent in a high-bypass turbofan engine. If you go to an airport and watch jets take off, you will see that they emit a faint trail of black carbon soot, which is typical of burnt jet fuel (kerosene), but you will not see water vapor. If there was any chance that high-bypass turbo fans would create enormous plumes of water vapor, it would occur in high-humidity conditions during high thrust. High thrust only occurs during takeoff and the highest humidity occurs at ground level as the air at higher altitudes has very low humidity levels. We don't see these enormous plumes of white water vapor during takeoff because these engines simply do not produce them. The average adiabatic lapse rate (the rate of decrease in temperature with altitude) is about 3 Fahrenheit per 1,000 ft. Since the average temperature on the ground is 59 F (15 C), you can calculate that at 30,000 ft, the average temperature is: 59 – (3 x 30) = -31 F (-35 C). This cold, dry air provides inadequate conditions for condensation trail formation. In this article, you can see a picture of a real condensation trail. You can also hear a detailed explanation in this video. Real condensation trails form, not behind commonly-used engines, but behind high-vacuum areas of wings. This occurs when a jet is pitching up or when the jet is using heavy flaps. Both of these conditions greatly increase the vacuum (lift) produced by the wing and therefore increase the probability of contrail formation. Contrails will normally appear on the outside edge of the wing or just outside the flaps when in a heavy-flap condition. Both of these conditions require high relative humidity. Contrails can also appear above the top surface of a wing while a jet is pitching up (such as just before touchdown) because of the high-vacuum created while changing pitch. Most of the wing-contrails explained above dissipate as soon as the vacuum zone ends. This explains why contrails typically last only 5 or 10 feet behind a wing (less than a second). As the vacuum zone ends, the air very rapidly reabsorbs the water vapor causing the contrail to disappear, except under the most humid conditions when the ambient air is unable to reabsorb the water. In contrast to typical turbofans, turbojets work differently. Instead simply pushing the majority of the air out the back using a large fan, all (or most in the case of low-bypass turbojets) of the air taken in by the engine is forced through the combustion section of the engine. This difference in design has a few important implications. First, these engines are less efficient at lower speeds (below ~mach 2), but they produce thrust of much higher-velocity. This is why they are used on jet fighters and other high-speed combat aircraft. They are not used on large military aircraft or commercial aircraft. Second, these engines have more water in their exhaust and therefore have the potential to produce short, non-persistent condensation trails when all of the required conditions are just right. These conditions are rare and so contrail formation is rare, but it can occur. Remember, turbojet engines are only used on jet fighters, not large military aircraft and not commercial aircraft. The rare-but-possible contrail-forming potential of turbojet engines used on fighter aircraft caused the development of contrail suppression technology. This technology reduces the contrail-forming potential of these engines so these jets cannot be easily spotted while flying over enemy territory. Government-funded disinformation contractors often cite these patents as evidence that high-bypass turbofans create contrails, but this is a blatant misapplication of the patents. The patents apply only to turbojets or low-bypass turbojets used on fighter aircraft, not high-bypass turbofans used on commercial aircraft and large military aircraft. Turbojets and low-bypass turbofans – the only engines capable of producing rare condensation trails – are not used on commercial jets today. Nor are they used on large military jets. Instead, virtually all commercial and large military jets today use the much-more-efficient high-bypass turbofans. Since we know that high-bypass turbofans are virtually incapable of producing condensation trails, then the trails we see coming from these countless jets today cannot be contrails. Instead, a mountain of evidence now indicates that these trails are deliberate particulate aerosols. You can easily identify high-bypass turbofans by their large diameter, and this engine type is clearly visible on all "chemtrail" jets we see emitting trails today. At the end of this article is an excerpt from a data sheet published from the European Aviation Safety Agency showing certain older Spey turbofans (series 500) that use water injection for improved thrust performance. The use of water injection in aircraft engines is rare, but it was also used in a few WW II aircraft, which explains the few "contrail" pictures floating around from that era. The Rolls Royce Spey 512 is used to power the BAC One-Eleven. This aging commercial aircraft is in very limited use today. There are about 50 still in service, and most are outside the U.S. If you see a short, non-persistent trail being emitted from a commercial jet, there is a small chance that it's an old Spey Series 500 turbofan. If you see a short, non-persistent trail being emitted from any large jet, it's a new non-persistent chemtrail. Keep in mind that a slowly-increasing number of chemtrail jets have been painted to look like commercial jets. We have already seen this deceptive tactic being used with military drones. For the past few years, many have witnessed the overnight change in the trail emitted from these countless jets from long, persistent trails to short, non-persistent trails. On the same day, many/most of the jets began flying higher, and this change was obviously done to make the spraying less noticeable to the public, and this was an important tactic they used to counter the fact that awareness of this massive toxic aerosol-spraying campaign is growing rapidly in dozens of countries around the world. Don't be fooled. Long or short, if you see a trail coming out of a jet, with very few exceptions, it's an intentional, toxic chemical aerosol. The United States government is currently spending hundreds of millions of dollars to spread disinformation to confuse the public on a variety of subjects. The most pervasive subject of disinformation today is about geoengineering/chemtrails. Below, we will expose the false claims that they make. Claim #1: Newer more modern jets are flying higher in the atmosphere enabling them to generate enormous plumes of condensation. Fact: The vast majority of witnessed trail formation has been witnessed by low-flying jets rendering this claim irrelevant. Fact: The altitude in which aircraft fly has remained unchanged for over 30 years. This widely-known fact renders this claim irrelevant. The favored altitude for commercial air traffic ranges between 25K to 35K feet, well within the Earth's Troposphere. 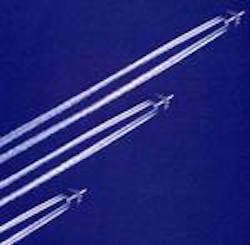 The vast majority of early trails (between 1995 and 2005) were witnessed at altitudes so low, the public was easily able to identify the jet type and count the engines. Between 2005 and 2010, numerous skywatchers witnessed sudden changes. First, they witnessed a majority of the jets changing from low altitudes to high altitudes. Second, they witnessed a majority of the jets changing their trail size from long-persistent trails to short, non-persistent trails. Both of these changes typically took place on the same day in any given location. It appears that this change was designed to make the trails appear less ominous to the public. It's important to note that even after this change, some jets still produce persistent trails several days per month, and this is likely necessary to avoid public scrutiny that would occur if all trails suddenly vanished. Claim #2: Newer jet engines burn fuel more completely turning more of the fuel to water. Fact: Modern high-bypass turbofans – which are used on virtually all large commercial and military aircraft – burn much less fuel per unit of ejected air; often 25% less fuel. Therefore, they produce much less water vapor than older engines. You will never witness a high-bypass turbofan ejecting water at an airport. You will only witness a faint, block soot that is the result of burnt jet fuel (kerosene). During take off, these engines produce the maximum amount of water vapor as compared to any other stage of flight because this is the time that the fuel-to-velocity ratio is the highest. In other words, if an engine was to produce visible water vapor, it would be most likely witnessed during takeoff. However, these engines are incapable of producing vapor trails even during their most inefficient operating condition: Takeoff. Claim #3: The sudden appearance of trails in the past 10 years is caused by an increase in air traffic. Fact: Air traffic increases less than 1% per year. This amounts to a total increase of about 9% in the past 10 years. What we have seen in the skies has been a dramatic – often sudden – increase in the total number of jets with virtually all of these new jets emitting trails while existing commercial jets did not. Furthermore, all of these new jets were unmarked, non-commercial jets flying at very low altitudes. In the past few years, we have witnessed these unmarked jets suddenly flying at higher altitudes and emitting short, non-persistent trails after emitting long trails for years. Probably an attempt to make the trails less noticeable to the public. Chemical particulate spraying was used in Vietnam and is believed to have been used in early testing in the United States in the 1980s. During this time, there were extremely few visible trails in the sky, and since high-bypass turbofans are virtually incapable of producing trails, these early trails were likely early geoengineering tests. Developing a program of this size would require many years of testing and development and there is much documentation that this testing has been conducted on the public for decades. It's worth mentioning that a few water-injection Spey turbofans are still in service, so it's likely that a few people witnessed them in the 80's and beyond. Today, about 50 BAC One-Eleven's are in service. This aircraft is one of the few that use water injection, but most of these aircraft are not within the U.S. Claim #4: The government worked on developing contrail-suppression technology because of the trails produced by commercial jets. Fact: The patents showing contrail-suppression technology were developed for low-bypass turbofans and turbojets, neither of which are used on commercial or large military aircraft. This technology was designed to suppress contrail formation on the types of engines – low-bypass turbofan and turbojets – used specifically on military jet fighters to make them harder to see over enemy territory. Government disinformation contractors use these patents to convince the public that the large jets we see in the sky are producing contrails, but all large military and commercial jets use very efficient high-bypass turbofans which are virtually incapable of producing condensation trails. Even the fleet of aging Boeing 707s produced from the 50s to the 70s which originally used low-bypass turbofans have now been retrofitted with highly-efficient high-bypass turbofans to dramatically cut operating costs. Claim #5: The photos floating around on the internet showing contrails from military jets in the 50's proves that jet engines produce contrails. Fact: The handful of photos from the 50s showing military jets and prop planes used water injection or internal combustion piston engines or turbojets, not high-bypass turbofans. High-bypass turbofans – the type of engines that are on the jets producing the massive plumes today – are virtually incapable of generating condensation trails. Claim #6: High levels of aluminum in rainwater is normal. Fact: There are a few atmospheric studies that show unusually high levels of aluminum in rainwater. These studies are often presented by disinformation contractors as "evidence", however these studies are in the vast minority and they are conducted near the ocean, downwind of industry, or other contaminating factors. There are countless studies and water monitoring programs that show historically that aluminum should not occur in rainwater, but studies selected by disinformation contractors are carefully selected to convince the public that contaminated rain water is "normal". Claim #7: Condensation from burnt kerosene freezes and produces ice trails at high altitudes. Fact: The vast majority of trails witnessed are at lower or medium altitudes making this claim irrelevant. Fact: At high altitudes, the air is colder and thinner rendering it less capable of holding moisture. This dry air further incapacitates high-bypass turbofans from producing contrails. Remember that most of the air coming out of a high-bypass turbofan is simply pushed through the big round duct by a fan blade (called "the fan") and does not get combusted at all. The United States government is currently spending hundreds of millions of dollars annually to confuse the public on various issues such as geoengineering/chemtrails. They are even teaching school children that contrails are harmless water vapor. This level of disinformation is unprecedented because a harmful, dangerous, and illegal program of this is also unprecedented. When those committing these epic crimes against humanity are caught, they will be prosecuted and executed, so they will spare no expense to convince the public that the sudden appearance of sky-covering plumes is "normal". It's vital that everyone explores this issue while keeping in mind that disinformation is being produced in the form of books, videos, Facebook accounts, blogs, photos, and that some of this disinformation is even aimed at "changing history" by convincing the public that contrails have always been around. You will be seeing more plumes appearing in old remastered movies and commercials. You will be seeing plumes appearing in books that have been artificially aged to look like they're from decades ago. You will be seeing medical studies made to look decades old and injected into journals and magazines that are archived online. This type of propaganda is not unique to our time. All of these methods have been used before, but with today's technology, the ability to deceive is incomprehensible because the ability to produce and distribute well-coordinated propaganda is surprisingly easy. We all know that helicopters don't produce condensation trails, yet most helicopters use turboshaft engines which work on the same principle as high-bypass turbofans. Turboshaft engines also use the same jet fuel. Despite these profound similarities, we don't see plumes of condensation emitted by helicopters. Many jet enthusiasts agree that the sound of a jet engine starting is the "coolest" sound in aviation. In the video below, notice how the sound of a turboshaft engine starting is identical to the sound of a high-bypass turbofan starting. Chemtrails in Animated Movies: "Over the Hedge"
Chemtrails in Animated Movies: "Cars"
Simple science dictates that diffusion prohibits the formation of condensation in low humidity conditions, such as those at flight altitudes. Furthermore, High-bypass turbofans emit carbon soot (burnt kerosene), not water vapor, and this occurs in the core of the output air-stream only. For more information about this, see this video. Bravo. A very nice summary. People will need to make hard copies and catalog this information and pass it along thru families because the risk is always there for the system to rewrite history so as to stamp away much of this info. It's the same issue historians face when they run into walls where information is "lost" or destroyed leaving them to make reasonable assumptions that nevertheless are impossible to prove in the sense of showing 2-3 sources etc… I still wonder about the real intentions since even with chelation and seed storage many of the wealthy will be destroyed and even they can't know for certain if they can control all the variables. Are there patents showing theories how accumulations from aerial spraying can be removed from the environment once their goals are achieved? Is it psy-op to bring in radical changes to society and then they'll shut down these programs once they've achieved total control? In theory they already own 90%+ of the planet's assets so they are plenty powerful, plenty rich and basically already control the major narratives. It's boiling down to insanity on their part. How can one reason if the goal or argument of the second party is unknown?! It reminds me of the situation in Greece where the German and other Eurozone Bankers agree that all of Greece's points are reasonable and valid and nonetheless still dictate their one-way, one-sided terms that basically prove to the Greeks those finance-capitalists are willing to kill them off beyond something like geo-engineering!